This case study concerns a client in a very different industry sector that we were able to find a selective invoice finance facility. The small business was an installer involved with the installation of car charging points for electric cars. They also undertook some solar panel installation, under the Government's green deal scheme. Car charging points, for electric cars, are becoming much more widely available, and in addition to their appearance in places such as car parks, people are starting to have them installed at home. Indeed some grant funding may be available to assist with this as part of the drive towards the use of greener fuels. 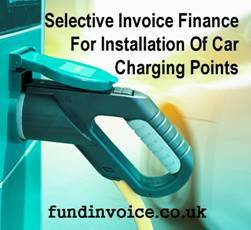 This particular client was involved with installation of car charging points for other businesses and organisations, hence they needed some funding in order to facilitate the growth of that business. With the Independent recently reporting that the UK needs six-fold growth in the number of charging points by 2020, to keep up with demand for greener motoring, I can only imagine that the demand for this type of installation work will continue to rise, so we are keen to arrange finance for fast growing installers. It should also be noted that funding against installation invoices is not universally accepted by receivables financing companies, however we can provide access to finance companies that are comfortable with this kind of debt and will be willing to fund, even if others have declined to get involved, or rejected your application. We have worked with many companies that work in fields related to greener energy, so we have funders on our panel that are able to assist them. We found our client an independent selective invoice finance provider that was able to assist with funding for all aspects of their business. The benefits of a selective facility are that our client can choose the invoices that they want to receive funding against, and they have no contractual obligation to keep using the service. This means that the funder will try hard to retain their business as they don't have any sort of minimum income charges to rely upon. The particular funder that we used have a reputation as being able to quickly deliver a very flexible service that the customers tell us they like. Of course if you don't want to go down the selective route, as number of clients don't, there are full turnover options available whereby you can discount all of your invoices. You will tend to achieve an overall discount on the pricing if you are prepared to live without the flexibility of being able to pick and choose which invoices to finance.